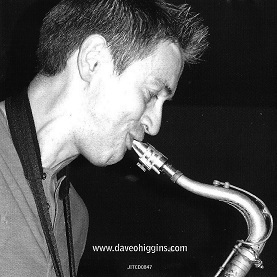 Dave O'Higgins plays soprano, tenor and baritone saxes as well as being an accomplished arranger and composer. Well known on the jazz club circuit he has worked in a variety of settings and is represented on CD from a quartet to a big band and has led his own groups for a number of years. His first records were with the National Youth Jazz Orchestra between 1983 and 1986 and he made the first record under his own name in 1992. He has worked and recorded with both Jim Mullen 1992-'94, Clark Tracey 1994 and Martin Taylor's Spirit of Django group from 1993 to '96. Another successful group that he recorded with was Sax Appeal with a five sax line-up from 1993 to '96. He has also, through to the present, undertaken extensive touring in Europe and Japan. for a number of years he has collaborated with pianist Darius Brubeck, son of Dave Brubeck, in the Darius Brubeck Quartet. Dave O'Higgins (ts,bs), Robin Aspland (p), Alec Dankworth (b), Jeremy Storey (d). Buzz/Waltz For Anna Christina/No Prizes For Guessing/Incident'ly/Lost In The Post/Every time We Say Goodbye/Dear Lord/Quids In/All good Things Come To An End. Dave O'Higgins (ts,sop), Joe Locke (vib), Joey Calderazzo (p), James Genus (b), Adam Nussbaum (d). Alone Together/Send For Igor/The Brood/moving Swiftly On/Forgone Conclusion/Don't Say Anything/Beats Working for A Living/Duke Ellington's Sound Of Love. Dave O'Higgins (ss,ts), Jim Watson (org,p), Mike Outram (g), Oriando Le Fleming (b), Winston Clifford (d). Decision Time/The Knock-on Effect/The Grinder's Monkey/Northern Exposure/Sweet Enough/Trying to Forget/Last Night/No Two Ways/A Perfect Gentleman. Dave O'Higgins, Eric Alexander (ts), James Pearson (p), Arnie Simogyi (b), Kristian Leth (d). Why Don't I/Inner Glimpse/Frith St. Blues/Estate/Ow!/I Can't Give you Anything But Love/Sketchbook/I'm Gonna Laugh You Right Out Of My Life/Water Jug. Dave O'Higgins (sop,ts), Martin Shaw (tp)*, Tom Cawley (p), Sam Burgess (b), Sebastiaan de Krom (d). In The Zone*/The Story So Far/Operation Yardbird/Theme For Ernie/Take the D-Train*/You Must Believe In Spring/Fiasco*/Young At Heart/Smile/Ca-Lee-So*. Alan Barnes (cl,ss,as), Sam Mayne (as), Dave O'Higgins, Judith O'Higgins (ts), Karen Sharp (bs), Robin Aspland (p), Adam King (b), Sebastiaan de Kromm (d). Dave O'Higgins (ts), Robin Aspland (p), Jeremy Brown (b), Sebastiaan de Krom (d). I Can't Believe That your In Love With Me/Devil May Care/My Ideal/Witchcraft/Guess I'll Hang My Tears Out To Dry/Let's Face The Music And Dance/Wives And Lovers/Close Your Eyes/Autumn In New York/Brazil. Dave O'Higgins (saxes), Darius Brubeck (p), Matt Ridley (b), Wesley Gibbens (d). Cathy's Summer/Fifteen/Crete/Ravely Street/I Don't Stand A Ghost Of A Chance With You/Flamingo/King Rene/Riviera Winter/Flippin' The Bird/Liberian Dance Suite No 3/Before It's Too Late. Autumn In Our Town/Years Ago/In The Spanish Mode/For Lola/The Rainbow/October/I Saw Your Father/Mamazala/More Than You Know/Caravan. 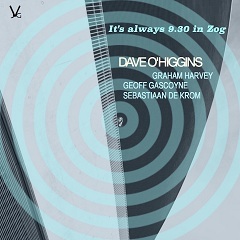 Dave O'Higgins (ts,ss), Graham Harvey (p), Geoff Gascoyne (b), Sebastiaan de Krom (d). It's Always 9.30 in Zog/The Adventures Of Little Peepsie/Alien With Extraordinary Ability/Nothing To Lose/Brixton/ Timelessness/ Morpheus/One For Big G/New Resolution/Humble Origins/Autumn Serenade/Easy Living. This page was last updated during January, 2018.